Let sleeping dogs lie, or so the saying goes. But airplane baggage handlers? Different story altogether. On Monday afternoon, a baggage handler set off alarms on an Alaska Airlines flight, after he found himself trapped in the plane's cargo hold. His reason: he fell asleep. In the cargo hold. On a plane. Alaska flight 448 was forced to return to Seattle just 14 minutes into its journey to Los Angeles after banging and shouting was reportedly heard from beneath first-class flyers’ feet. On inspecting the noise after landing, rescue workers discovered the baggage handler, employed by Menzies Aviation, in the cargo hold. Talk about oversize luggage. 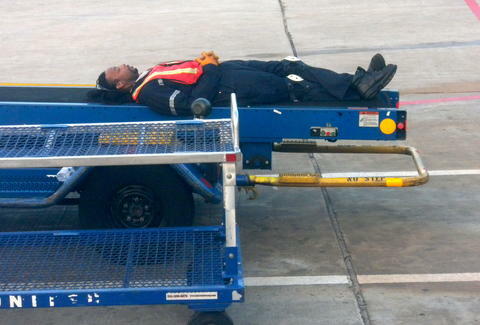 The unnamed worker claimed he'd simply dozed off on the job. Thankfully, the cargo compartment was air-pressurized and temperature controlled, so the man was able to withstand take-off, and though he appeared to be fine, he was rushed to hospital for a precautionary check-up. ​According to the BBC, Alaska Airlines said the man passed a drug test and was later released from hospital, adding that his colleagues realized he was missing before take-off, but, unable to reach him on his cell phone, assumed he'd left for the day. Which was technically true. Just not of his own volition.